Congratulations to our award winners for 2017-2018! The Economics Department is pleased to announce the winners of this year's undergraduate awards for academic excellence. 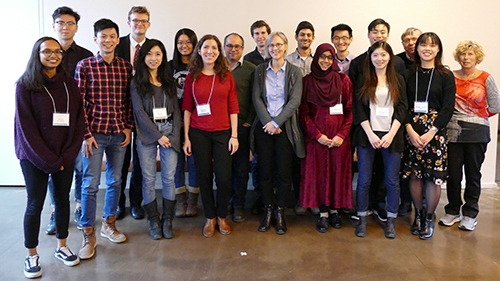 The department celebrated the achievements of these outstanding students at its annual reception, held on November 30, 2018. We are most grateful to the donors and sponsors of these awards, and appreciate their support of the efforts of our students. This award was endowed by our late colleague, Professor Ed Safarian, who was a member of the Order of Canada and a renowned policy expert. The award goes to an outstanding student in a specialist program in Economics. Matthew wrote a thorough and balanced appraisal of emission trading or “cap and trade” as a policy prescription for the emission of pollutants. Rachel wrote about the real estate market in Toronto, high housing prices and recent policies put in place to improve access to affordable housing. April wrote an interesting paper on the consequences of Ontario government’s rent control policy.